With the great financial and creative successes of The Man Who Knew Too Much and The 39 Steps, Hitchcock remained free to choose his projects. With this freedom came a clear level of confidence. Even though only one film stood between Number 17 and The Man Who Knew Too Much, there's a complete reversal in the sense of comfort in the storytelling. The dialogue and characterization are lean and always feed into the story. 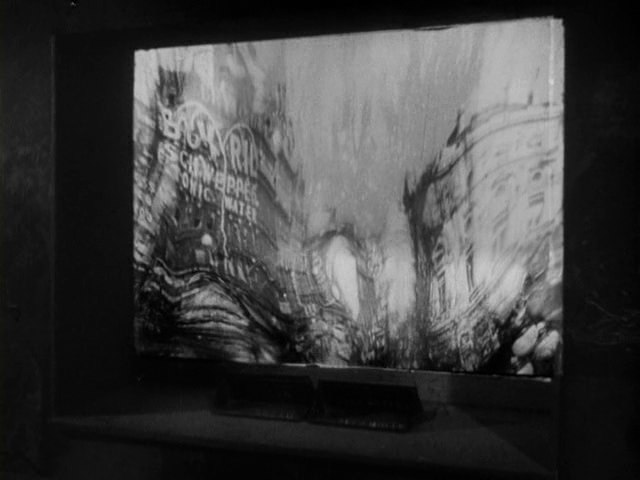 The visual pyrotechnics now only appear in order to further the scene or film. And there are full consistent themes that are addressed throughout each movie, in almost every sequence. With The 39 Steps and the films that followed, this maturity continued to grow. It's a pleasure to watch this growth happen. 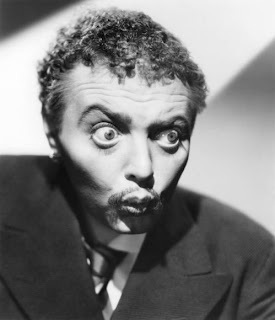 Many of his earlier films (especially the theatrical adaptations) are a chore to watch, especially when there's no hint of Hitchcock (or any competent director) involved in the production. Now it's getting interesting watching him grow up. He was my age during the Number 17-and-Waltzes of Vienna period, the deepest of his creative struggles. So it's reassuring to watch the success that followed immediately after. With that success came films that are so competently made that craft and style discussions seem to burst from them. Let's try a couple. Adapted from two of M. Somerset Maugham's short stories, Secret Agent has a great cast of John Gielgud, Peter Lorre, Madeleine Carroll, and Robert Young. As the script was being developed, tensions were rising throughout Europe over Germany's agression. The filmmakers seize this atmosphere and set the action during World War I in the midst of actual battle. The story is about three British secret agents who are sent to Switzerland to find and kill a German secret agent before he crosses over to enemy territory. They kill a man who turns out to be innocent, then have to chase the real agent into Bulgaria to assassinate him. Technically, the film is solidly made on all levels. There's a great theme running throughout about how the noise of conflict prevents successful communication. Besides this metaphorically happening between characters throughout the script, Hitchcock activates it cinematically via multiple sequences where loud harsh mechanical noises keep people from hearing pivotal information. The camera work and editing combine to create many scenes of great suspense, including a massive police-and-spy chase through a Swiss Chocolate factory! This issue I have with the film has to do with plausibility and how it affects the tone, characters, and overall story. FT: Not to mention the waste of time for the public! FT: (...) Incidentally, one play on words I rather like is your own saying: "Some films are slices of life. Mine are slices of cake." These are great guidelines for all storytellers. I agree with everything said. 1. A writer who, though he had previously served in the military, appears to have never killed anyone before this assignment. 2. A woman who seems to be doing this on a lark and clearly is unable to handle any level of espionage. She freaks out at the first moment of danger and panics to the point that she'd rather kill her allies than the bad guy. 3. An imbalanced, infantile sociopath who is comically terrible at keeping his cover. With these three knuckleheads assigned to kill an important German agent, it's no wonder that they keep bumbling the mission. Thus the first half of the film has a goofy bubbly tone. This sort of setup is for screwball comedies. But once the events start to go wrong the film pivots abruptly to a tragic, melodramatic tone. And this doesn't work. Why? Plausibility. By assigning these incredibly unfit three people to do this job, the British military itself can be called into question. It's blunderingly stupid. It's parody. Thus the story's inciting incident (sending these three dolts on the mission) makes no sense. Without that inciting incident there's no story to tell. So if that piece is flawed to its core, so will be the story that follows. Psycho's shower sequence is often mentioned as the pivotal moment in cinema that altered audience expectation about who will live and die in a film. I would like to take everyone back another 24 years to Sabotage. The hub, the midpoint, the central scene to Sabotage is an extended, overwrought build up to one tasteless moment of exploitation. And it is so good, that Hitchcock apologized for it for the rest of his career. The first thing you need to know is that the film is a story focused on domestic terrorism. A German(!) immigrant(!) is used as a pawn by a terrorist group to incite fear in Londoners. He sabotages the power grid at the film's opening, but London winds up having a good old time in the dark. So his shadowy bosses decide to have him deliver a bomb in the middle of a royal parade. Yes, a ticking bomb. Set to go off at 1:45. But Scotland Yard is on his case, so he hands the packaged bomb to his 12-year-old brother-in-law -- a happy-go-lucky kid -- telling the innocent boy to drop off the package at a specific location before 1:30. He casually hops onto a city bus. But it's not just any city bus. There's a film-loving warm-hearted ticket taker. A sweet old lady. And a puppy! A cute puppy who plays with the little boy as the clock passes 1:45. And the bomb explodes, killing everyone on board. The suspense is insane. The overdone build up is so enjoyable that I started laughing. I knew something ironic would happen to stop the bomb from blowing up. Right? No. Hitch kills the innocent. 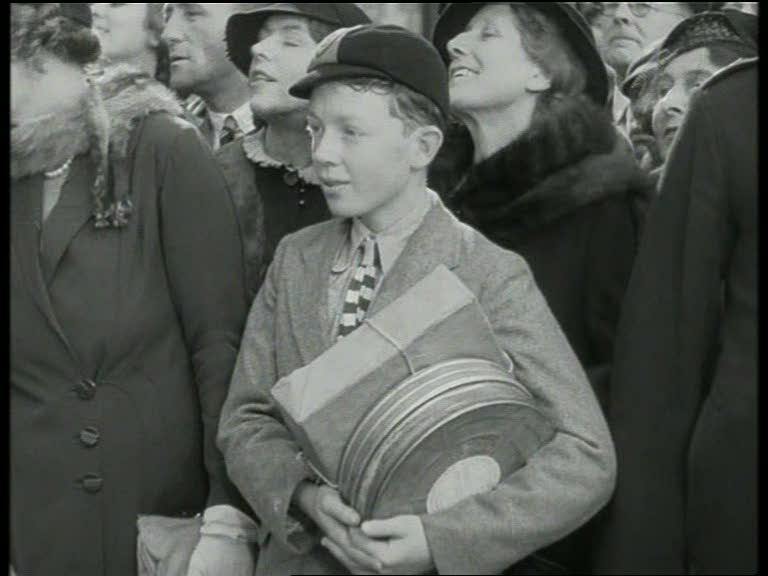 The boy, the nice old lady, the generous film buff. The baby puppy! All burned to death in the explosion. Then Hitchcock cuts to the main characters laughing. Wow. The film is never the same after that. It turns into a nervous kinetic meltdown: A spectacular death scene done in silence. Hitchcock's birds make their first appearance and they're everywhere. A poignant Disney cartoon! Guilt. Grief. Suicide. I'm not even sure how this screened in the US. Sure, there are weaknesses in the film. The acting is questionable (aside from the great Sylvia Sidney) which in turn weakens the love story. The early pacing is sluggish. And the ending is a direct ripoff from Blackmail (though that's not entirely a bad thing). Yet the power in the second half of the film and the many layers woven within make up for all of that. And ultimately, the bomb sequence is a use of cinematic power. Not an abuse. It's showing an act terrorism. And by fully engaging the audience through the power of film, it does so effectively. Up to this point in Hitch's career, this is his best film. I mean, he's wielding the power of the cinematic gods now. What will follow? Sinyard, Neil. The Films of Alfred Hitchcock. Multimedia Books Ltd., London. 1994.